In this cityscape tapestry Courtyard Alsace we see the work of Philip Craig. Craig was born in 1951 and studied in Ottawa and Oakville, Ontario, and graduated in design. His paintings are exhibited in Canada, the UK, China as well as many other countries. Here we see abundant foliage bringing the eye to the archway in the distance. Full of colors of nature, the browns and greens, are illuminated beautifully by a play of light on the pathway as well as on the foliage. 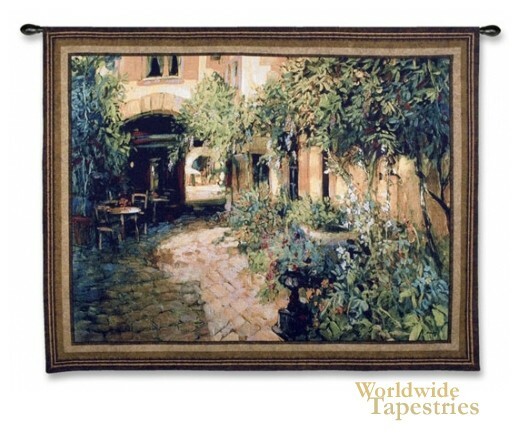 This Courtyard Alsace tapestry is backed with lining and tunnel for easy hanging. Note: tapestry rod, where pictured, are not included in the price. Dimensions: W 65" x H 53"